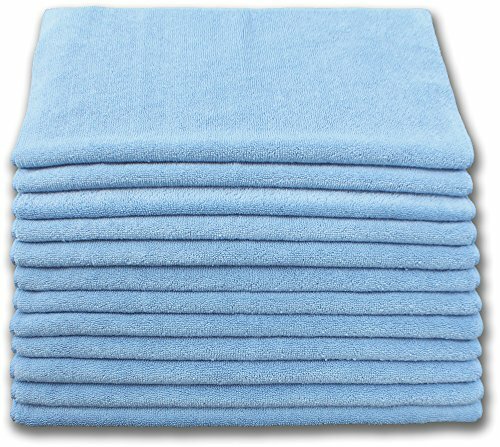 These terry microfiber cloths are our heaviest weight microfiber cloths and are produced from 400 gsm weight specifications, an 80/20 blend of split fiber Polyester and Polymide and are 16" x 16" in size. This additional 48+% weight increase over standard 230 gsm cloths in the market will increase performance as well as extend product life an equal percentage based on use Conditions and processing techniques. These heavier cloths are ideal for healthcare applications, general cleaning applications, Car detailing or in any application where use conditions allow for extended product life. These terry microfiber cloths are our heaviest weight microfiber cloths and are produced from 400 gsm weight specifications, an 80/20 blend of split fiber Polyester and Polymide and are 16" x 16" in size. This additional 48+% weight increase over standard 230 gsm cloths in the market will increase performance as well as extend product life an equal percentage based on use Conditions and processing techniques. These heavier cloths are ideal for healthcare applications, general cleaning applications, Car detailing or in any application where use conditions allow for extended product life. Brand: Direct Mop Sales, Inc. If you have any questions about this product by Direct Mop Sales, Inc., contact us by completing and submitting the form below. If you are looking for a specif part number, please include it with your message.